We're sure you'll enjoy our founder Marshall Howard in this recent presentation to a packed audience of nonprofit and corporate leaders. Everyone talks about the importance of relationships in capacity building. Our products focus solely on showing development professionals and their boards, step-by-step, how to grow their mission by making relationships stronger and more genuine. Give us a call; we'll give you a free solution you can use right away! 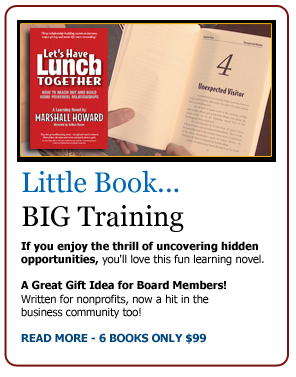 Our Services: Marshall Howard is the author of “Let’s Have Lunch Together,” a leading keynote speaker, trainer and coach. MH&A’s training programs and fundraising products focus on building collaborative relationships to boost: nonprofit fund raising, nonprofit major gifts, nonprofit development, nonprofit fund raising events, planned gifts, capital campaigns, event sponsorship, board retreat programs and board fundraising, capacity building, donor retention, sustainability and other nonprofit needs. A nonprofit or motivational keynote speaker is essential for a successful fundraising campaign, to infuse fund raising ideas or for a successful nonprofit fund raising event. Professional keynote speaker and fundraising consultant, Marshall Howard is sought after as an executive coach, not for profit consultant, nonprofit speaker or non profit speaker, keynote speaker and key note speaker as well as a Board trainer and board retreat speaker. For the corporate or for profit sector, we specialize in keynote speeches and team training for sales, customer service, and vendor relations.